Still digging out the Ocean Monument. The torch trick worked. If you have a long column of sand to dig out, just dig out the bottom block, and super quick place a torch in there before the sand has a chance to fully fall. The sand blocks then break themselves on the torch and you are left with a stack of sand in a fraction of the time it would take to break all those blocks… and drink milk to deal with the Guardians. And it’s fully dug out….. sorta. But I’ve only dug out a portion of the monument – maybe 1/3 of it. So now it’s time to expand the box. One thing I had figured out is that it’s easier to fill in if instead of simply pouring sand and super slowly expanding the “island”, you fill it in in a box first, and then put lines of sand through that. It reduces the area that the guardians have to swim and spawn in. And then, I ran out of sand again. Four large chests full and I can’t even fill in enough to start digging out. Left side is about 2/3 full. Out I went to gather sand, and managed to fill it all along the left side. The process of digging it out was difficult, partly because of the difficulty of draining the inside of the temple. All the sand is great at emptying the exterior. The interior is a big challenge to fill with sand – bigger than I have patience for. The second you expose the interior, Guardians are attacking you, and it’s very possible to get lost and drown trapped under the roof of the monument. So I gave up trying to excavate it “dry”. The destruction begins on the right wing. Impressive screenshots are at an end. Now it’s just a matter of breaking the thing down and getting at the “treasure” – sponges and gold blocks. No elder guardians found yet – one is in the center top of the temple, and still looking for the other two. After my son, yet again, got interested in Minecraft and building all kinds of strange things, blowing things up with TNT, and all kinds of creative-mode shenanigans, I found myself loading up my latest Minecraft world and adventuring again. While my super-long-road project was well behind me, TAGN took a slightly different take on the whole thing and has been progressing on it for months. The Mysterio world – so named because I deliberately decided not to use the various tools for finding things – has revealed Swamps, Roofed Forests, Deserts/Beaches, and Oceans. I have a cobblestone path through a lot of the ocean, having decided not to hoard dozens of chests filled with a single resource, and instead to put it to use building various things. Seems I have not posted about this map since June of 2016. And as I read my old post I realized I never finished digging out the Ocean Temple. Time to restart the project. Armed with tons of sand, I began dumping it into the ocean months back. I had sketched out a box which, from the limited land-based view, seemed to cover the major parts of the ocean temple. 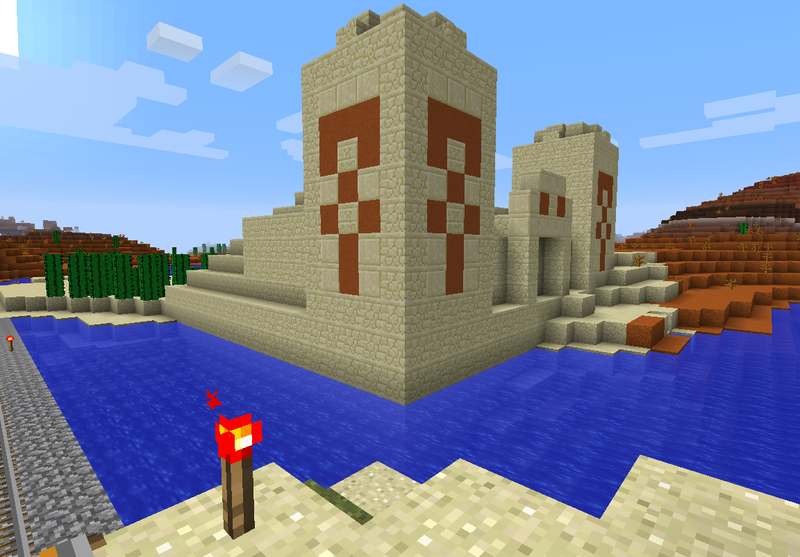 After running all over the desert I eventually got enough sand to fill in the box and cover a lot of the temple. Expand the wheat farm. By the time I’ve finished harvesting, the first blocks are ready for reharvest. Trap a couple of cows and start beef/leather farming. All the beef and leather a man could want. 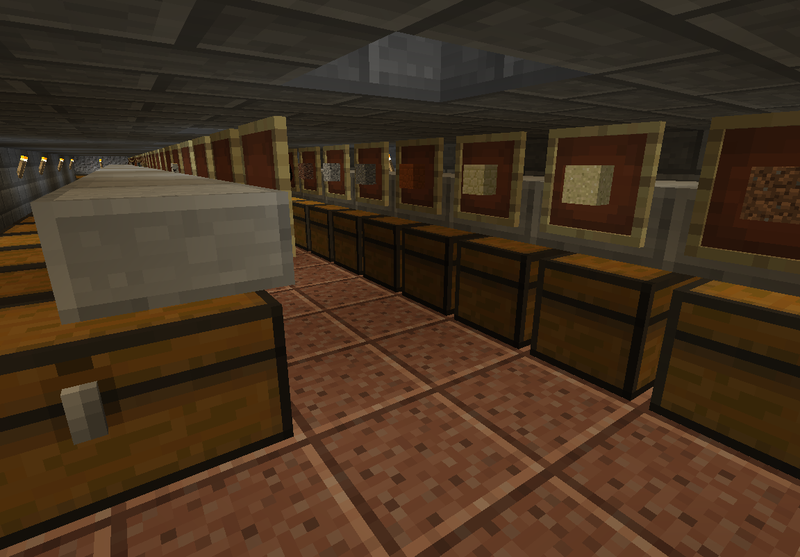 I have not yet managed a full chest of iron ingots – which is what I was waiting for to start building a railroad. Increasing the iron generation in the game was a smart idea, so that instead of digging and saying “Bah. More diamonds. Need IRON !”, I have enough iron for a massive railroad. If I can dig it up. So far, I have resisted the temptation to simply harvest the exposed blocks and start destroying the Monument. I just read about a trick to re-gathering the sand I will have to try out, which should make it a breeze. And then, I’ll want to cover the left wing as well as finish covering the right wing. One additional tidbit discovered having read a lot of Ocean Monument posts on the internet is that they are about 77 blocks long. With a little math I can sketch the box out a bit more accurately. Huge columns of sand to dig out. It’s getting to look like a structure under there ! So now, I should dig down to the point that I can walk into the front door. It will take a bit of time, but that’s always available in Minecraft. The Mysterio world has finished its first in-game year, but no end is in sight. I’ve been having quite a bit of fun with my boy helping me out in my single-player world in Minecraft, so we talked about it – Should we buy a Realms world once again ? He thought carefully and said that it sounded like a good idea. We’ll see if I can keep his interest for a month, but it’s worth a try. So I purchased a Realms subscription ($8 a month is not bad, really) and immediately found out that it had changed since last year when I had the subscription. Now, you can have ?three? worlds saved/set up and have one world active at any one time. There are apparently a million minigames set up, which I don’t really have any interest in. So I decided to create a survival shared world with the rest of the real-world crew of friends, kids, friends-kids that played last year. Assuming they still have any interest. My interest waned quickly, because creative mode is not really my style. My son claimed he wanted to play Minecraft, but quit quickly. All the friends loved it, naturally, and built a lot of neat structures. So I can create more worlds if Survival doesn’t work out too well. And thus, the beautiful world of NuclearFart was born. 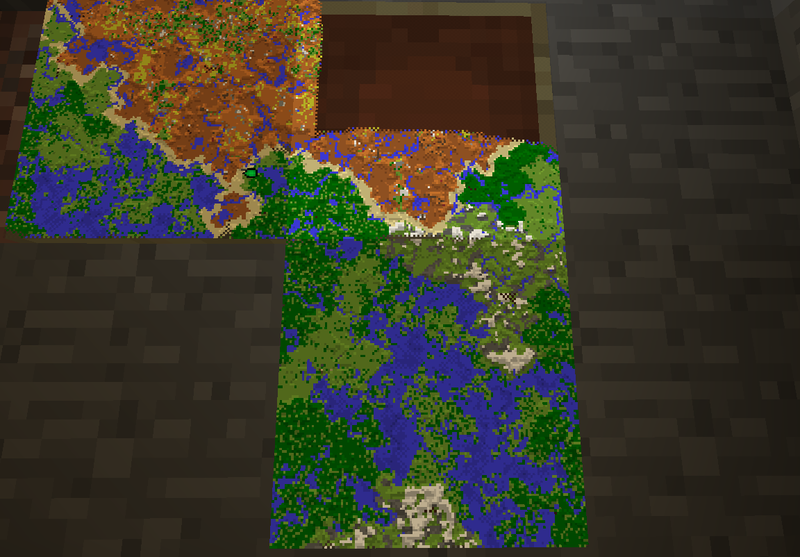 This is a customized world with Iron generation increased a lot, along with a very small uptick in Diamond creation. After spawning in a desert, I ran over to the nearby desert village(Wheat !) and then chased after the first trees I could see. We found some sheep there and managed to kill three of them for some wool. But this left us out of time, and it became dark real quick. So my son dug a hole, we jumped in, and we mined through the night cycle. He found a buried canyon and started exploring, while I just ran up and down the stairs to make sure no skeletons would spawn. Soon enough it was daytime, and we killed more sheep to have two beds available. Now, if nighttime hits, we can just plop down beds to sleep through the cycle. Time to make a base of operations, create some chests, and find something to do otherwise. Then I’ll let the friends know the Realm is open again. It remains to be seen if they’ll actually want to play a survival game. After getting the heads up that version 1.10 was out for Minecraft, I dusted the cobwebs off of my install and took a look at the game again. 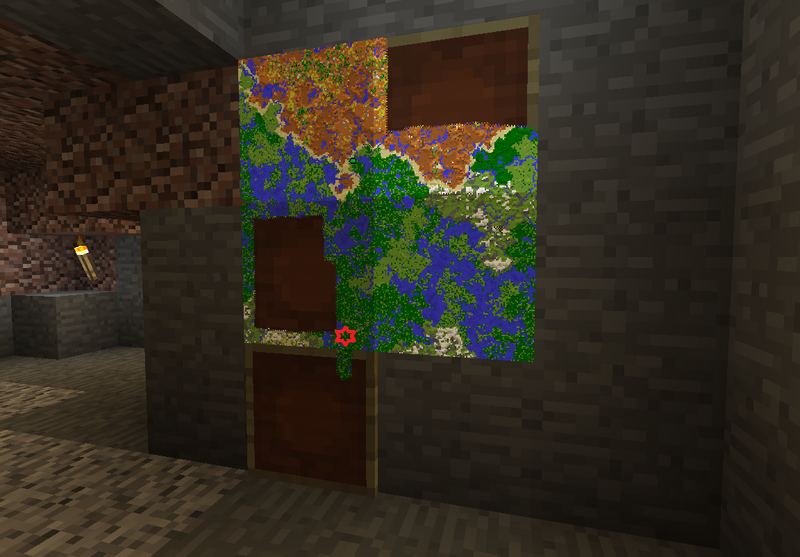 But this time, I paid attention to TAGN’s post with the beautiful maps created. These are created by MCMAP, a little program that generates nice image files which are actual maps for the game. The last time I looked at this program, it was command line only. Despite being a child of the ’80s when the command line WAS ACTUALLY COOL, I let this scare me off from trying it. Never fear – it’s been updated to have a GUI, and I’m glad I gave it a try. It’s a piece of cake to use. The center of the map clearly shows my little base, and the roads/bridges that I built throughout the ocean as I explored. This map, generated deliberately without trying the external mapping tools like AMIDST, features Dark Forest, Desert/Beach, Grasslands, and Swamp. And lots of Ocean. In my last Minecraft post I used the game as a way to connect with my son, and this session was no different. We looked around for a bit, and then were surprised to see an Ocean Monument nearby. So my new mammoth project – which I may or may not bother finishing, in true Minecraft spirit – is to fill in the monument with sand or whatever materials come to hand, and dig it back out again for mining / exploring. I understand this kills the sea creatures that guard the area very effectively. It takes a long time to gather enough sand to fill your inventory, and I got started eventually, filling in a fair amount with a first full load. I realized, part of the way in, that I should probably excavate this piece by piece instead of trying to surround the whole temple. That way, my sand used for this piece can also be used to fill in the next area. I am constantly bombarded by the Guardian’s attacks. They don’t care if you’re standing on land/sand, or in the water, if they’re in range they attack. Mining fatigue is irritating and is the major determinant of strategy – gather sand. Dump. Then dig out more sand. Five minute chunks without being able to mine materials makes anything else impossible. Eventually, we really got things moving. This is the 5th full load of sand. For me, anyway. I started digging down but got discouraged at the Mining Fatigue attack. Quick googling reveals the idea of using milk, but I probably need to pen up some cows first for milk. In any event, it will happen eventually. That’s a start. Maybe 10 blocks down. Seems I’ve settled on a three – legged set of games to play for the moment. 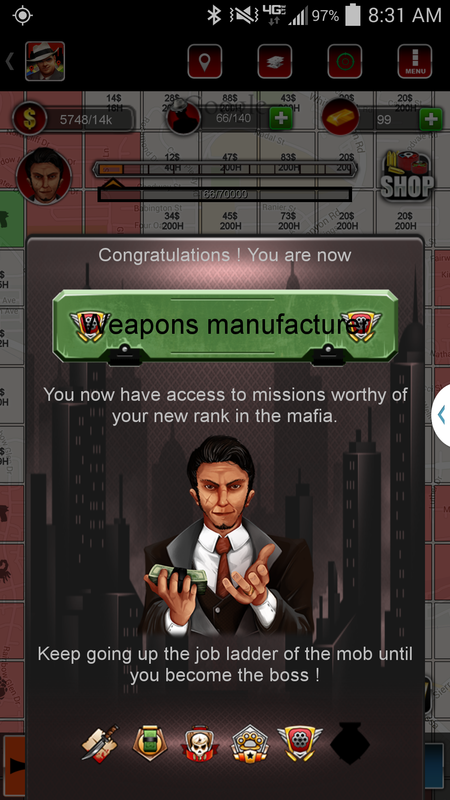 Mobile gaming is Ingress. Enough said. Read recent posts for more info 🙂 . PC Gaming alone is Marvel Heroes. Cyclops will soon be level 54, and 60 won’t be far behind. The fights are colorful, and chaotic. I think I’m starting to get the hang of the game as well – just what are you supposed to do in the game ? Level up to 60. This is not the end of the game – it’s the beginning. Acquire uniques, at quality 63. Acquire a legendary weapon – go to Asgard and buy it with Odin marks. Time to level it up. Somewhere in here are blessings for your weapons – final level of uniques is quality 69. Unlock more heroes, and do it again. Many synergy bonuses here. There’s more that I don’t quite get. The gear grind manifests itself in many ways, instead of older-school MMO style of “Go on a raid and hope something drops for you, and you have enough DKP”. Omega points are one, although they are usable by all your heroes, I think starting at level 30. Relics are another – bind them to a hero and collect them, one at a time, for teensy extra bonuses each. Trade in your uniques (? They’re unique, but I collect them? Whatever.) and get other bonuses. It’s best enjoyed in small doses. I read with amusement TAGN’s getting treated like a noob by his daughter while playing Minecraft. “No Dad – hold down shift” << sigh >>. I’ve experienced that many times myself. And sharing the world with his daughter. And I thought – why not try that with my son ? I loaded up my old world from last year, and didn’t really feel like continuing it. 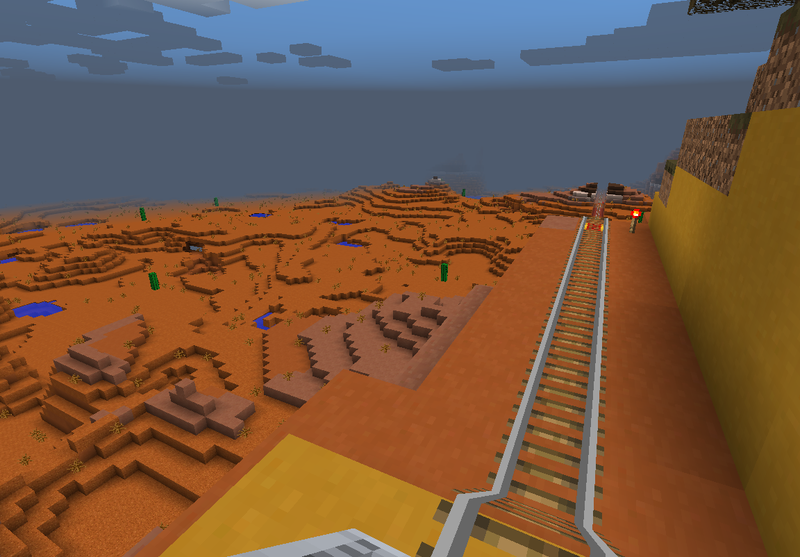 I wanted to start again, map as I went, and build my railroads a lot faster rather than trying to experience all the biomes – I’ve done that already. And using tools for intel I don’t think helped either. I did use similar world-building parameters, so I’d get enough Iron and a smidge more diamonds, and started the game up. And so, my first world. 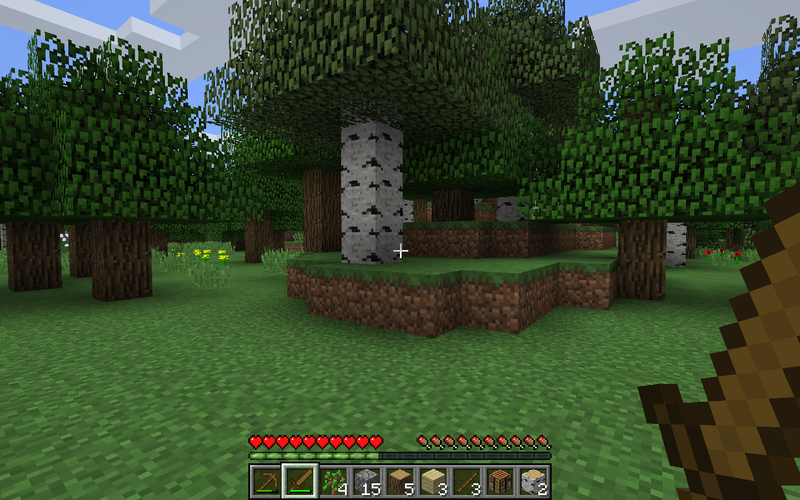 I ran like a madman looking for the most important thing for your first day of Minecraft – sheep. Kill three sheep, and you have 3 wool, and can make a bed and survive your first night of minecraft. I couldn’t find any sheep. World #2. This time I start in a swamp. 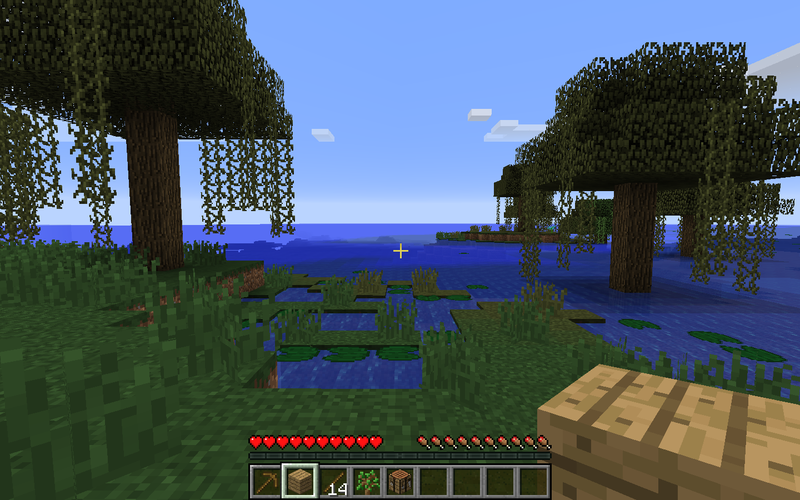 A swamp island on the edge of an ocean – and wonderously, sheep right next to the spawn. I swam from the island to what looks like a continent, and found coal in a little tunnel drilled through a hill. And so, my first base was born. 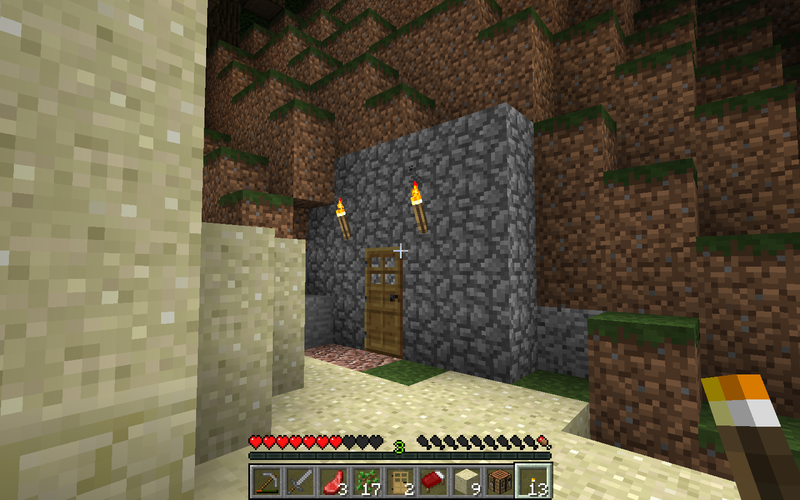 After closing off both ends of the tunnel, it’s now a base. My son, not interested in the idea at first, watched me play and said “Wow that actually looks like fun”, and came into the world to help me at this point. 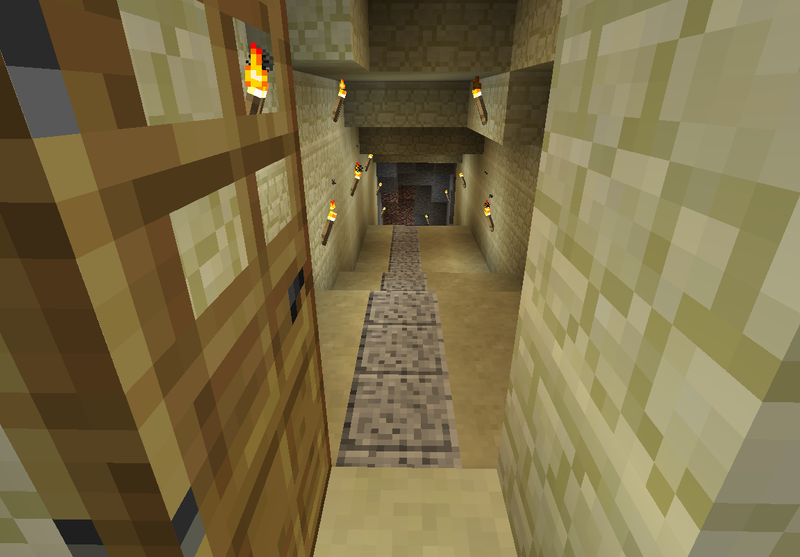 Wheat farming is now started, a mine to level 12 has been established, and a treasure room is under construction. I’ve even escaped death so far. I plan to make it look nice immediately – I typically have waited until I have thousands of items stored in chests, and I’m not going to do that this time. Having found lava, I set to work baking cobblestone in my oven, while my son clears trees from the area – the base is in an Oak Forest biome and so there’s tons of cover for monsters during the day. Started on the interior roof, since I had to fill in the holes anyway. My boy pushed back the forest this far at least. 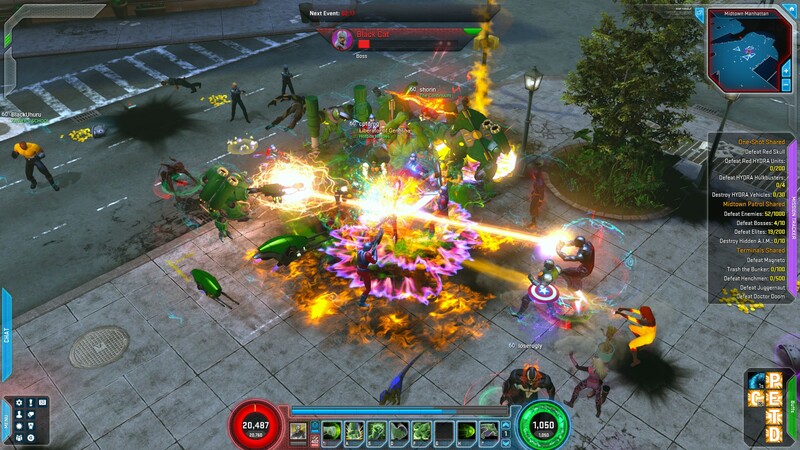 So we have an intensely PvP-like game (Ingress), the ultimate in relaxing and sandbox (Minecraft), and an exciting MMO pulling you along on a treadmill (Marvel Heroes). That’s a good mix for the moment. 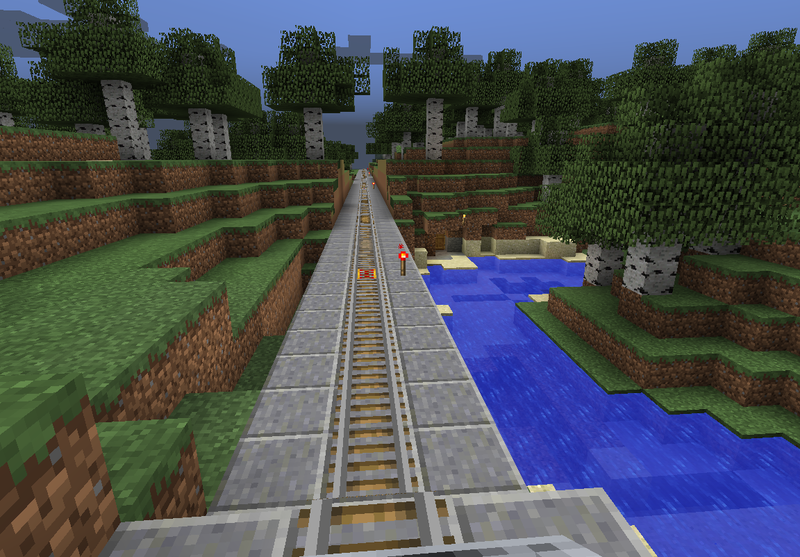 The Base to Dark Forest railroad is now complete. The material for the path when in the forest needed to be considered, and I selected Andesite because of the nice look, yet gray. 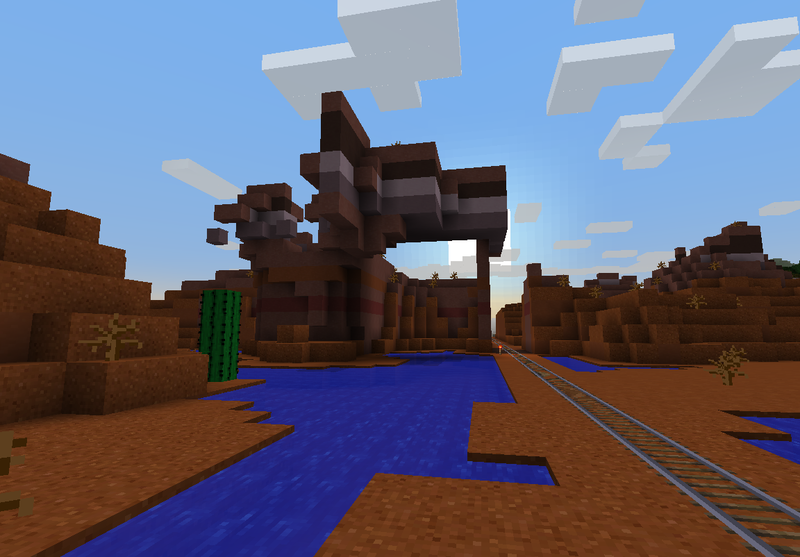 I also needed to cross mesa and desert, and after not being able to come up with a good material I realized sand and clay just looks fine all by itself. And with that, it was a matter of flattening out the path and digging tunnels (two), and laying the track. End of the line. Approximately 3000 blocks. I plan to do something with the temple, not quite sure what. I’m ringing it with cacti first along all the land approaches, and I might make a boat dock at the entrance in the screenshot. 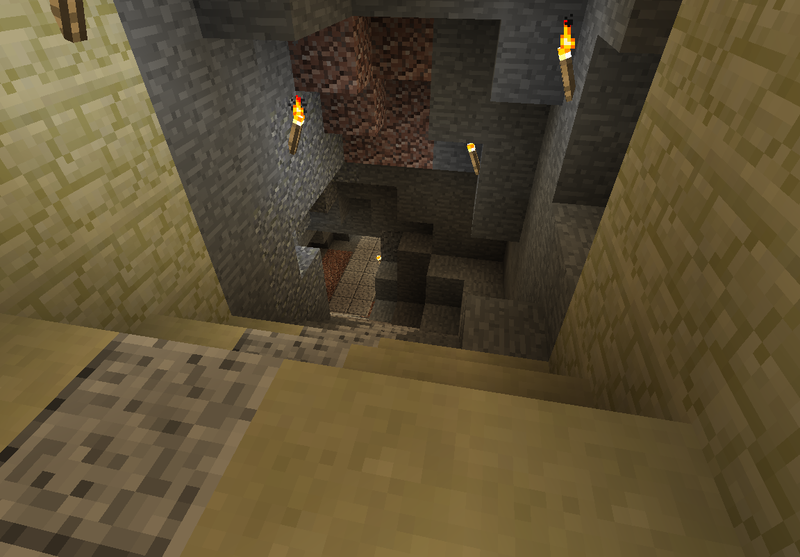 It turned out that I had to have a tunnel here – as I dug along the top of this mountain, I exposed a skeleton spawner. I looted it and torched it off, so it’s now safe. But not wanting it to be seen when riding, I realized I had to go farther down. 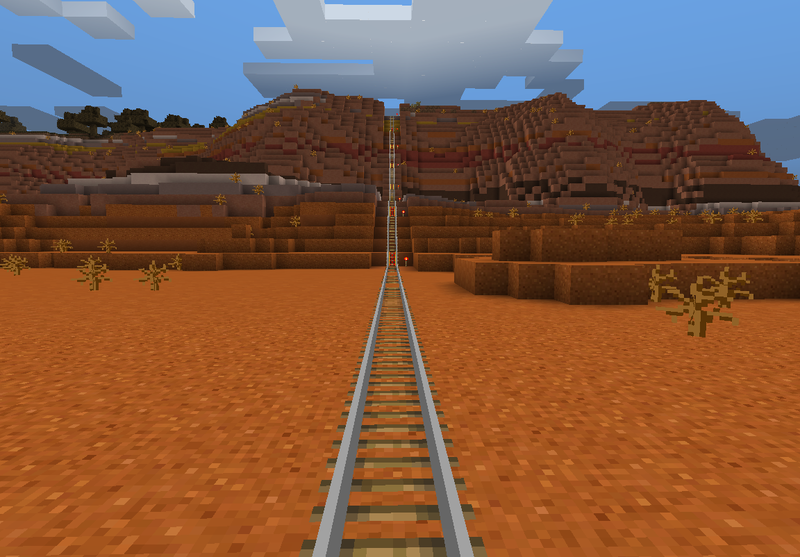 I went over this massive mesa because the tunnel would have been very long. The view from atop the mesa. I also ended up with an overflow chest of hardened clay, and half-full chest of dark oak. Now, time to expand the maps. I started improving my roadway system but it’s not much at the moment. I have a three-wide cut and path through the small part of the Mesa leading southward. 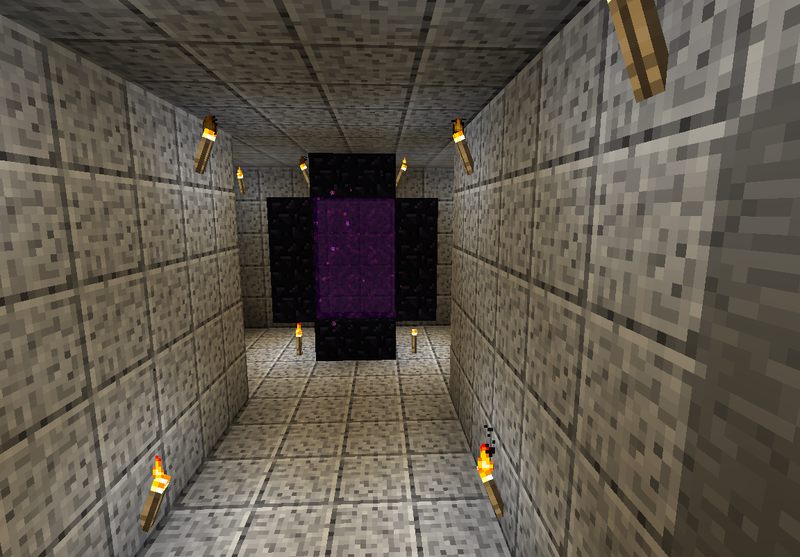 But the Nether Portal is complete. I got some inspiration wandering through branch mines, and looking at how striking the white diorite veins were. 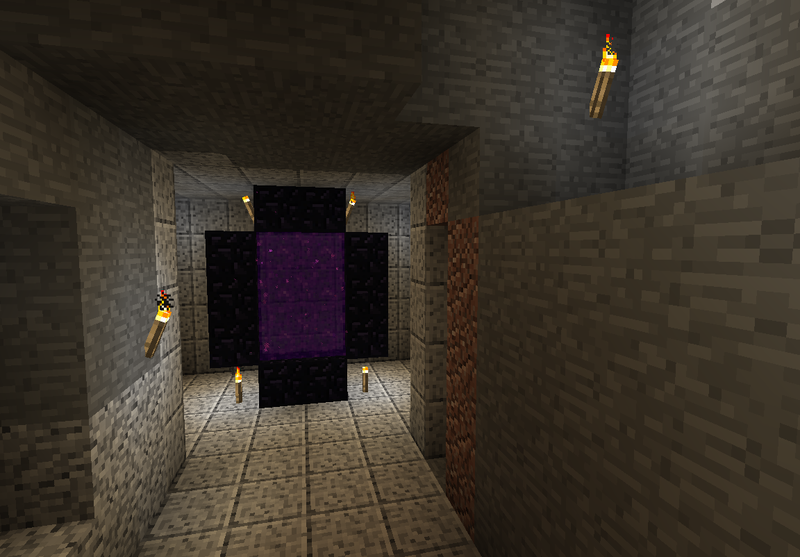 So I decided to make a Diorite Portal. Step 1. Construct the portal way underground. Step 2. Even out the area and square it off with polished diorite. Step 3, was to make the entrance and walk in be impressive. 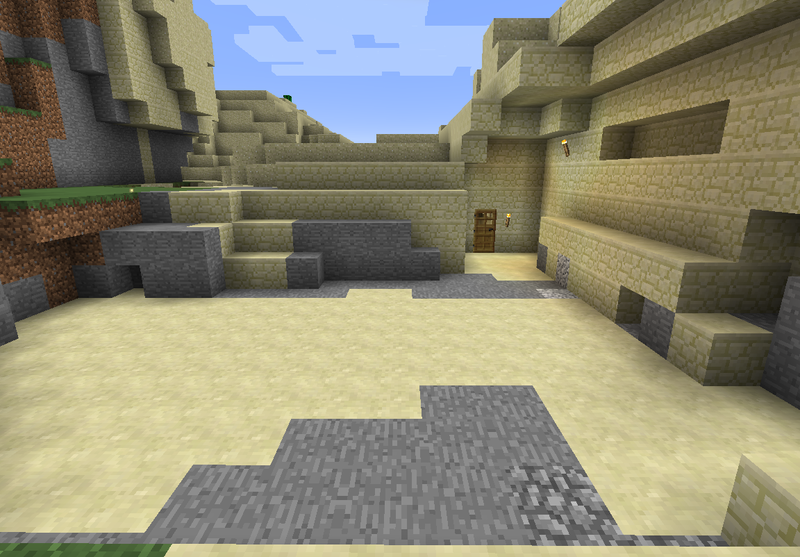 I filled in this area and the outside entrance to the mine(s). And I put a little door into the one cavern. 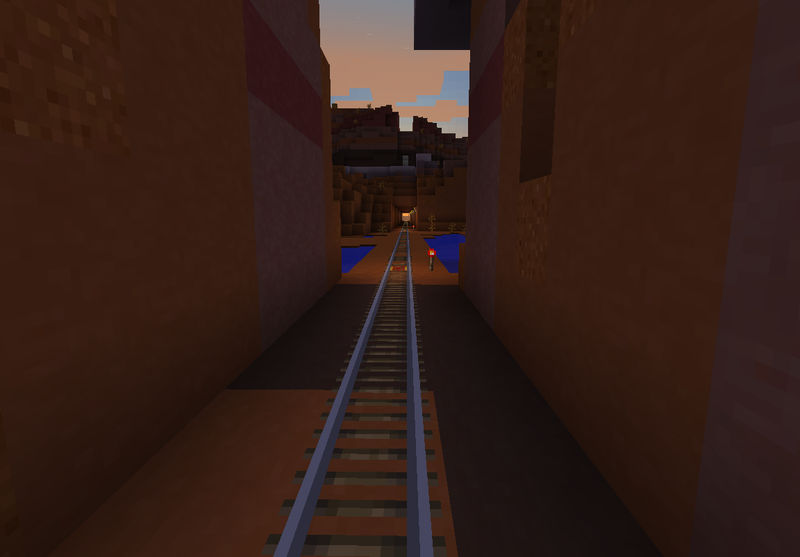 Add a diorite pathway to the portal. 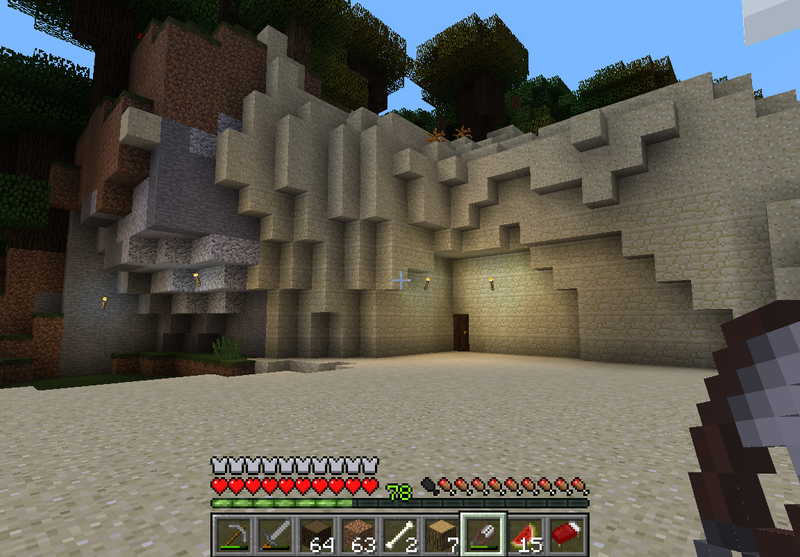 Filled in the cavern with sandstone for the effect of descending into the desert depths. 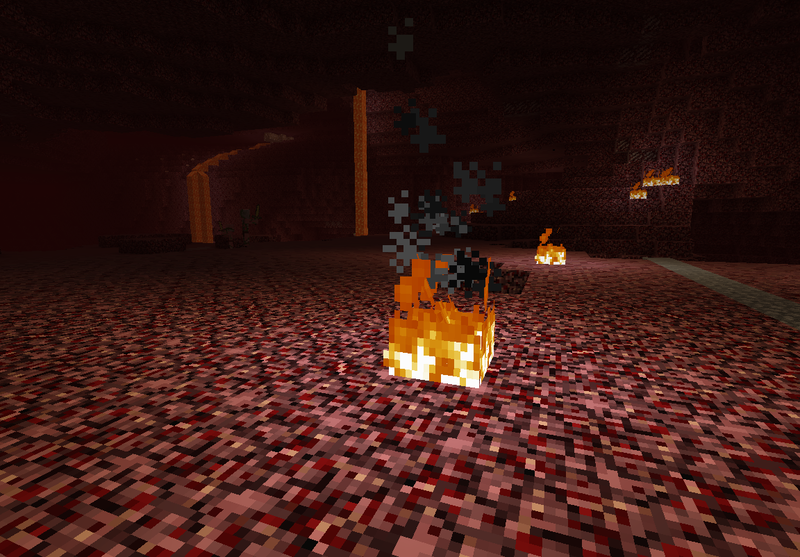 The portal leads to a medium sized cavern in the Nether, populated by a bunch of zombie pigmen and one ghast. After several tries, I managed to bat one of his fireballs back to him and kill him, after he set a lot of fires and blasted a lot of netherack. 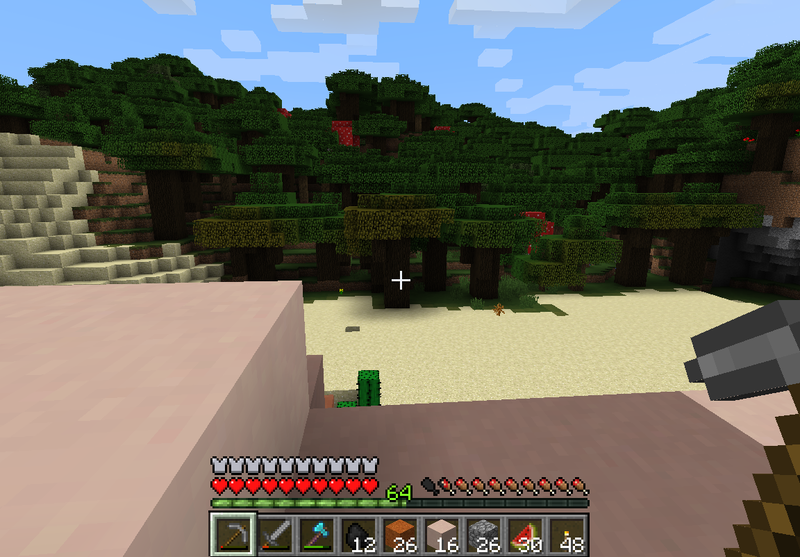 Thankfully, I didn’t hurt any zombie pigmen. After building a cobblestone barrier around the portal, putting in a chest and a crafting table, I started making a pathway through the nether. Rude little shelter. It’ll do. What I saw when first stepping out of the portal. 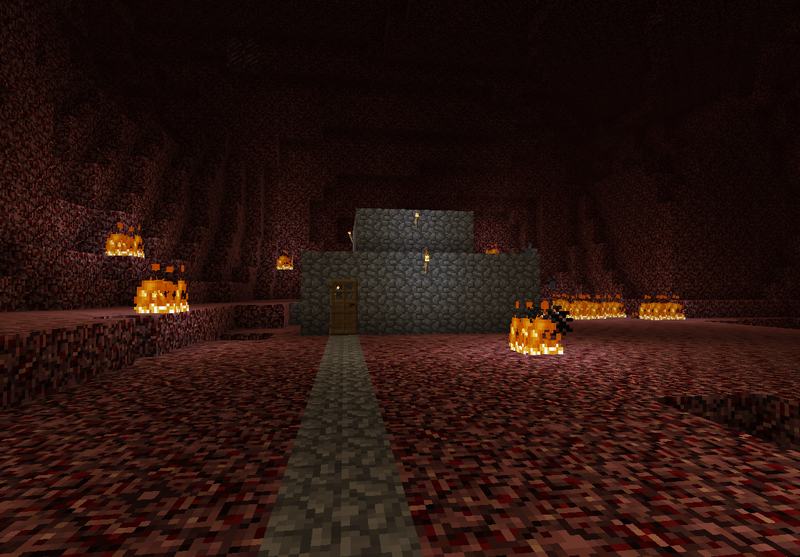 Now, to explore and find a nether fortress. 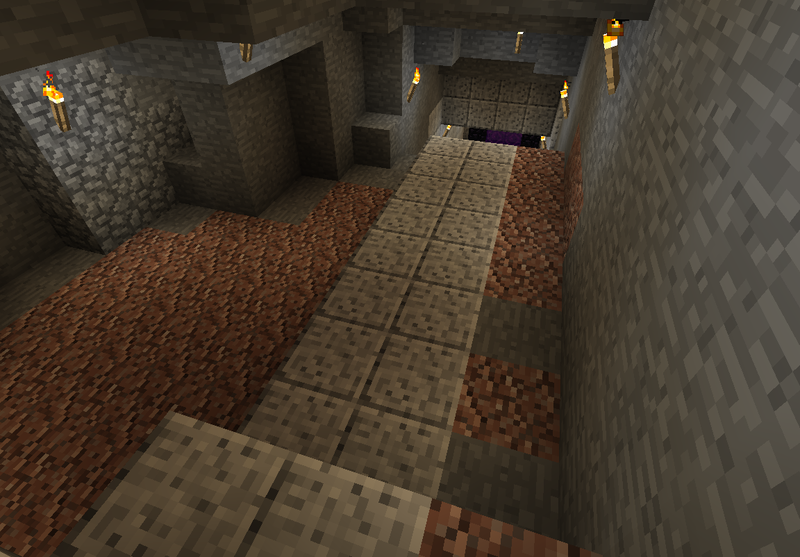 As I pushed southward, I encountered a new abandoned mineshaft, which has taken most of the week to explore and loot. After running low on food I headed back to the main base. Red star = Mineshaft. 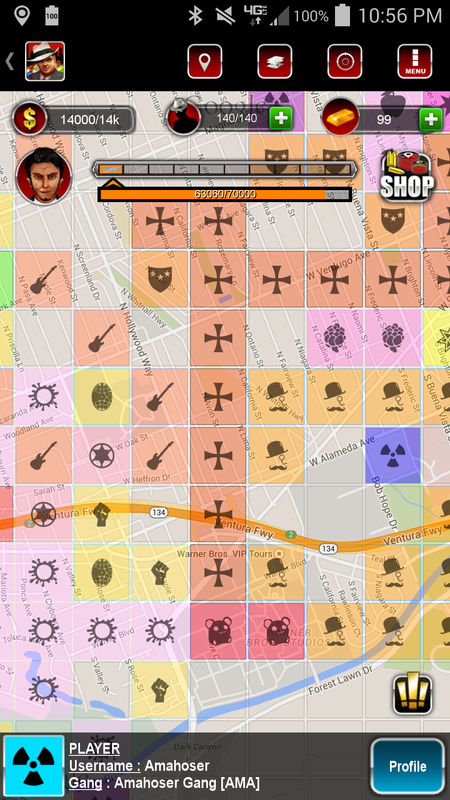 Map now covers five level 4 (maximum size) tiles. 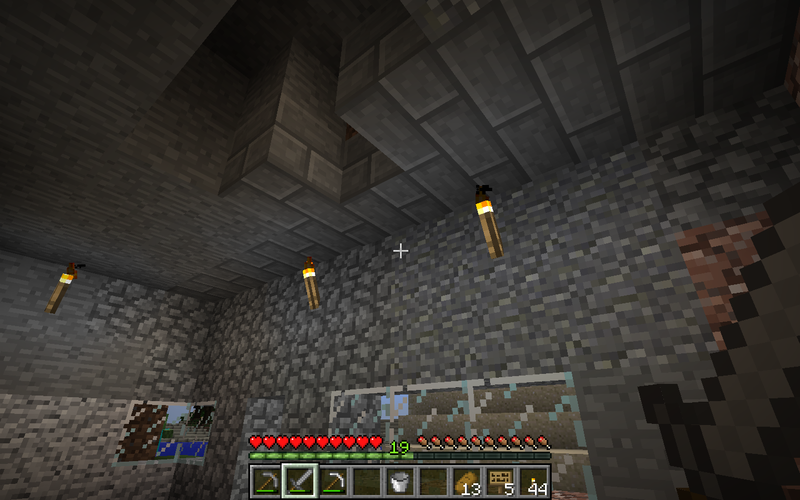 The mineshaft has one cave spider spawner – I destroyed the second one I found – along with a zombie, skeleton, and a regular spider spawner. No real excellent loot, probably the most valuable thing were 19 more precious gold blocks. It will take quite a while to cart all that stuff back to the main base, but I’m not too interested in that for the majority of the items – why worry about adding to overflow storage ? 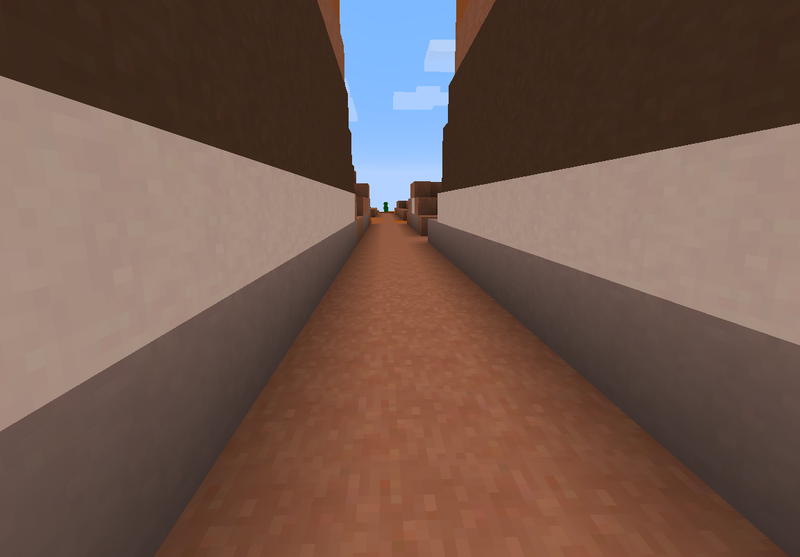 This base leads to the mineshaft and is a mere 10 blocks or so from the 500 longitude mark, where the road has been cut south to the limits shown on the map. Still no jungle. 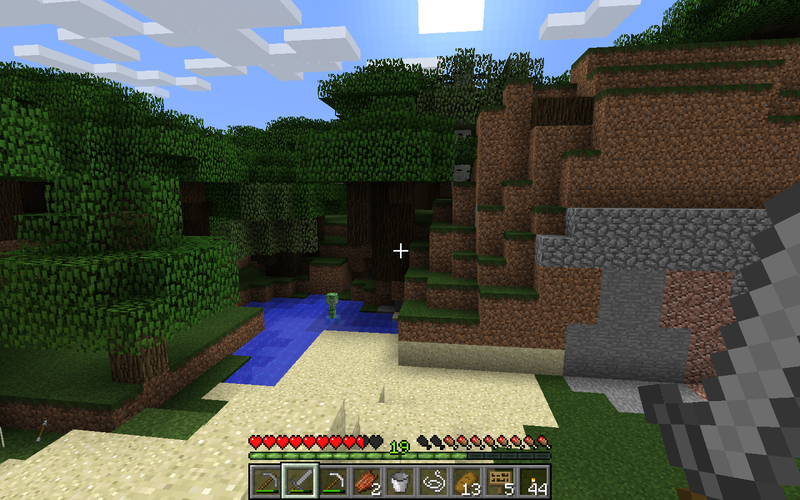 No ocean found yet, which is a bit odd, with most of the other biomes not expected to be found. But I sure ain’t going to quit looking. I had no idea of the enjoyment I might get by not using Amidst. 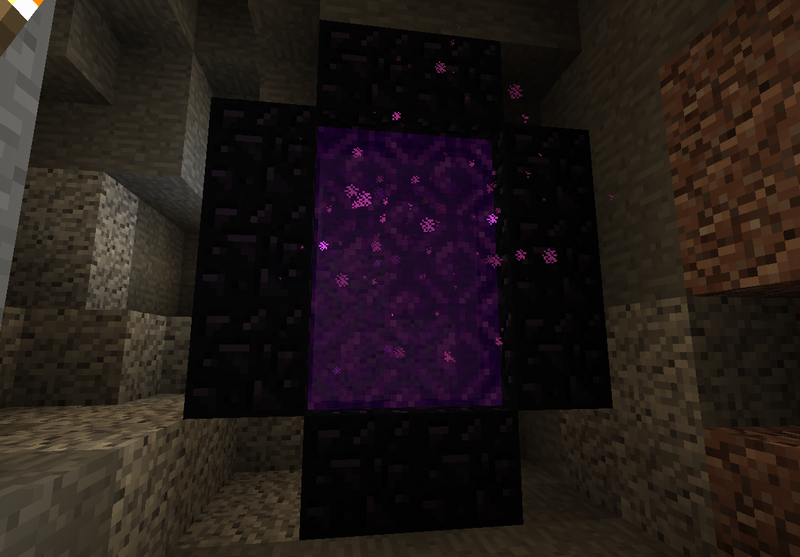 Nether Portal. Along with a structure to hold it since mobs now come through. Railroad along the road system. The only question being if I have enough gold. Expand the homebase. I really have no idea what I’d like it to look like, is the main stumbling block at the moment. Expand the map room and make really big ones. The only problem with maps is, filling them out at high zoom levels takes a long time. I have a single Level 3 map, and haven’t attempted to make any Level 2 or lower. 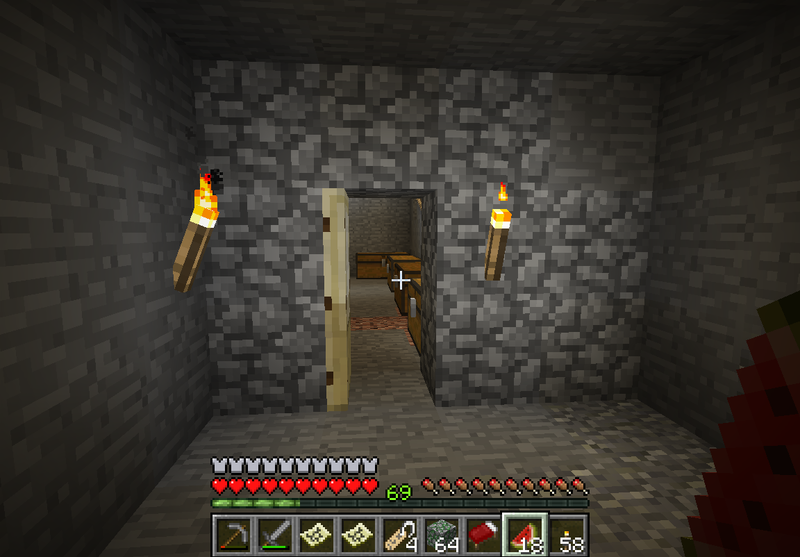 Instead of doing any of that, I’m back in the Mineshaft, still digging, still exploring. 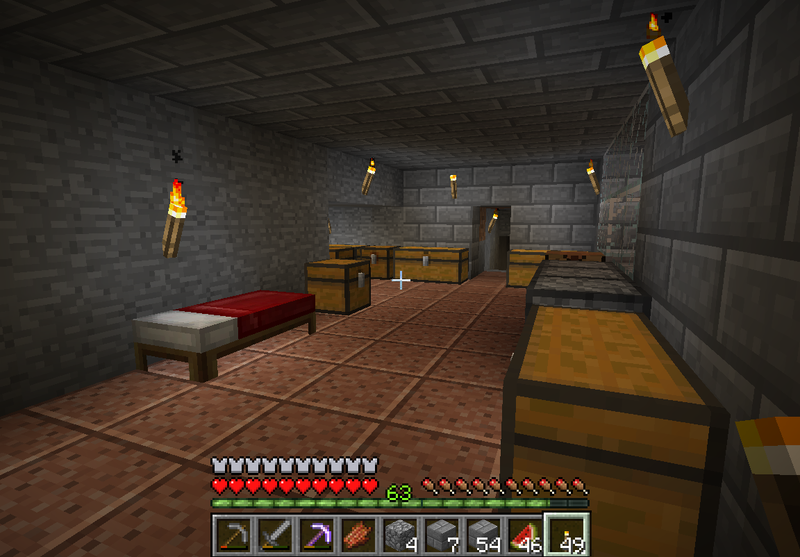 I’ve gone ahead and started making my home base, more of a home than a hovel. 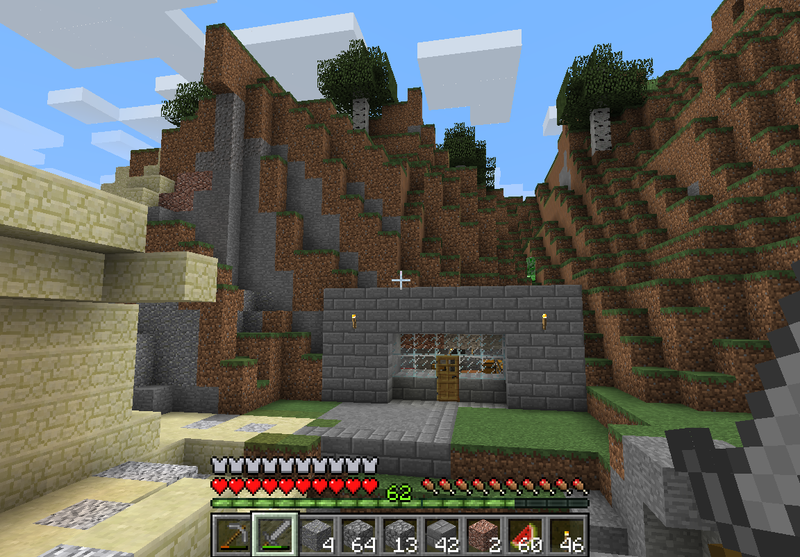 With enough stone bricks for walls, and neat looking granite floors, the place has changed a bit. The outside wall now looks much more imposing. No more dirt and ores. 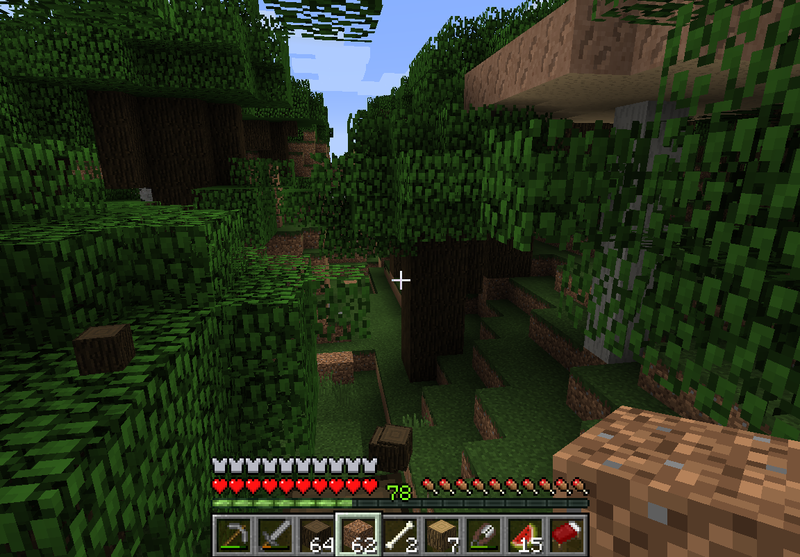 I then spent several expeditions digging nothing but the three new ores. They tend to all interesect, so if you’re digging just them, you can dig 99% of the three and leave the cobblestone mostly alone. Almost one chest filled with each type. Don’t like the look of andorite for anything yet. Granite looks good for interior floors. 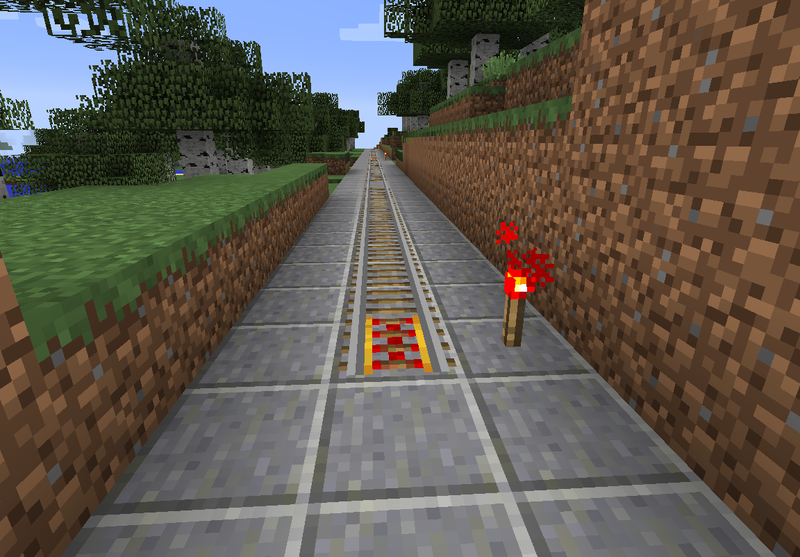 I like the andesite for a pathway; not sure if I want to go to all the effort of making one as my roadway, or if I’ll just use some cobblestone variant. Then, I went to work inside. All granite floors and stone bricks. All granite floors. This turned out well. Stone bricks and granite. I left the walls that I probably will dig out later as normal stone. Exploration continues as well. I have now completely mapped out map #3, populated by swamps, birch forests, and with some mountains in the center-ish north and south. Obviously the next quadrant to explore is the one south of my home base. The road is at last getting expanded, most of the way across map #2. 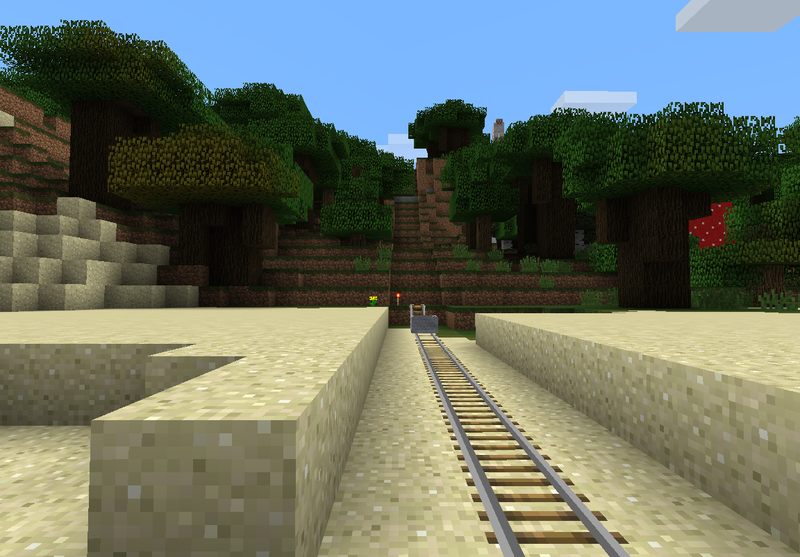 After digging through the mesa, the road reaches the Dark Forest. In true Minecraft fashion, I keep meaning to create a chamber and portal to the nether, but I get distracted by other ideas. So I’m not making any predictions on what I end up doing next.